Sydney, Jan 25, 2012 (Global Fashion Wire) - Designer Morgan Leigh graduated from the University of New South Wales with a Masters degree in International Relations (Human Rights). A Fashion career isn't exactly the first thing that comes to mind is it? Well while Morgan's passion may lie in Human Rights, fashion is a close second. So she decided to mix the two, which resulted in LOVEleigh Designs. Hailing originally from Canada- now living in Australia, Morgan is striving to create a socially conscious clothing company. Mixing the need and desire to help those less fortunate, while creating current, unique yet trendy pieces all working towards empowering and helping those around the world who need a helping hand and a little bit love. 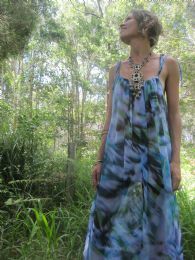 Being that LOVEleigh Designs is in the start up stages, having only broken onto the Australian fashion scene a mere four months ago, LOVEleigh Designs is leaving quite the imprint in the Northern Rivers area (NSW), moving up to QLD, and soon will be available in Sydney, and across the country! The line 'Jungle Fever' is inspired by the deep and tropical jungles of the Byron area. The entire line has an easy glamorous bohemian feel, with a very apparent beach vibe. All creations are handmade in Byron Bay, and will eventually be taken offshore to Bali- a place very close to the designer's heart. "I want to help give back to people that need it the most. It was luck that I ended up being born in a country like Canada- full of opportunity and support, but not everyone has that." Morgan is very passionate about not only using Balinese hands to create socially conscious and sustainable garments, but also, providing locals in poor communities with the ability and supplies to create the fabric themselves, which will then be purchased from them by LOVEleigh Designs. Using local sustainable and ethical labor to create the garments, will not only help to empower the local populations but also to give them training and the ability to stand on their own two feet. A percentage of the profits will then be brought back to the communities, and in conjunction with the locals, grassroots initiatives will highlight local in determining where the money is most useful, whether it be clean water systems, schools, or medical care unit etc. LOVEleigh Design's current line will be showcased to the Australian Fashion community at the Creatives event hosted by Chic Petite Events on February 1st, at Queen Street Studios in Sydney's Chippendale.